If it wasn't for electronics, the Apollo astronauts would have exploded, frozen or fried. The first stage, known as S-IC, was built by Boeing at the Michoud Assembly Facility in New Orleans, LA. It used RP-1 (Rocket Propellant-1) as fuel, a highly refined form of kerosene similar to jet fuel. It is significantly more powerful than liquid hydrogen and is stable at room temperature. It is combined with liquid oxygen acting as an oxidiser, which causes the RP-1 to lose electrons and burn more intensely. The 42m (138 ft) tall first stage provided over 34,000 kilonewtons (kN) of thrust and fully fueled had a weight of 2300 metric tonnes (5.1m pounds)! It was powered by five engines arranged in a quincunx (four at each corner of a square with one in the centre). It lifted the entire rocket to an altitude of 67km (38 nm). The second stage, known as S-II, was built by North American Aviation at Seal Beach, California. Using liquid oxygen and hydrogen, it also had five rockets. The S-II was approximately 25m (82 ft) tall and had a diameter of 10m (33ft). Fully fueled it weighed over one million pounds (480,000kg)! Rather than having two fully-separated tanks the S-II saved on weight by having a common bulkhead between them made of aluminium and a resin designed to insulate against the 70ºC (126ºF) temperature difference between the two tanks. Getting the Apollo spacecraft all the way to the moon was going to take power – a lot of power. And to build a rocket of such magnitude was going to take a great deal of expertise – German expertise. And the US had that expertise, rocket scientists taken as spoils of war by the Americans at the end of the Second World War, including, most notably, Wernher von Braun. Von Braun had worked on the German’s V-2 rocket program, the first long-range guided ballistic missile and the first man-made object to travel into space. Although V-2 attacks resulted in the deaths of over 9,000 Allied civilians and military personnel, the US government was willing to overlook that fact in its cold war against the USSR, which had also obtained V-2 technology and refined it to produce an ICBM it used to put the first man-made satellite, Sputnik, into space in 1957. After coming to the US, von Braun worked for the Army on the Jupiter rocket program in competition with the Navy’s Vanguard program. The Vanguard was initially chosen to launch the first American satellite into space, which angered von Braun, who predicted, “Vanguard will never make it.” He was correct – in the wake of the Soviets’ success with Sputnik, the rushed first launch of the Vanguard TV-3 rocket containing the first American “test” satellite exploded four feet (1.2 metres) off the launchpad, hurling the satellite from the top of the rocket into nearby bushes, and earning it the nickname “Kaputnik”. The predecessor to NASA, known as NACA (the National Advisory Committee for Aeronautics) turned to von Braun and the Jupiter program for a solution, desperate not to lose any more face to the Soviets. Von Braun and his team developed the Juno I rocket, a modified Jupiter-C with an additional fourth stage designed to propel a satellite to an orbital velocity of 8 kilometres per second. In early 1958 it was used to successfully place the first American satellite into orbit, Explorer 1. The single engine that had powered the Jupiter rockets’ first stage was obviously not going to be sufficient to lift that much mass into orbit and while the Jupiter’s additional stages had multiple engines, they needed to be physically spun to stabilise them – obviously not a viable solution for the first stage. The third stage, known as S-IVB, was built by the Douglas Aircraft Company at Huntington Beach, California. It had a single engine and used the same fuel as the S-II. It was approximately 18m (59ft) tall and had a diameter of 7m (22ft). It weighed 119,000kg (262,000lb) fully fueled. The S-IVB could be restarted once per mission, the second burn needed for trans-lunar injection. 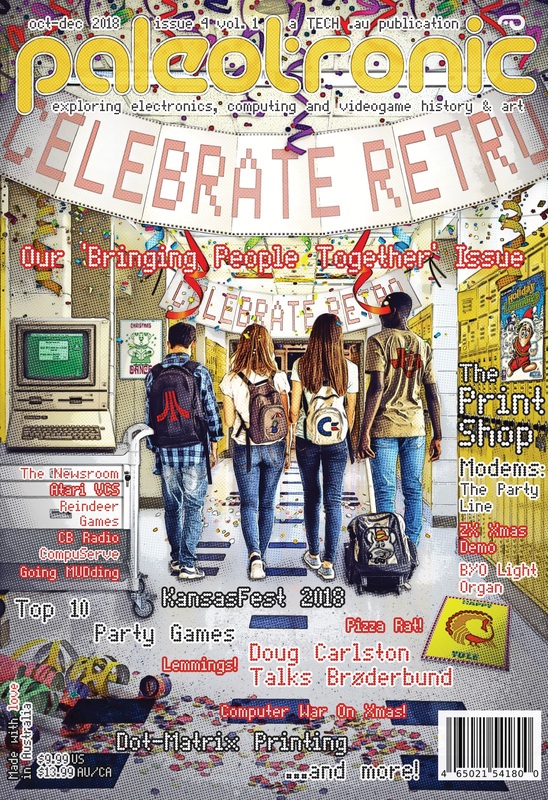 Happily, while von Braun was perfecting his rocketry, computer science had also marched on, and offered a solution to the complex problem of ensuring the rocket remained stable during takeoff and in flight. By the late 1960s a digital computer sophisticated enough to manage rocket navigation and guidance in real time could be made small enough to be housed on the launch vehicle itself. Housed inside a ring-shaped structured fitted to the top of the Saturn V’s third stage (highlighted in red on the model to the right), the Launch Vehicle Digital Computer (LVDC) monitored gyroscopes and accelerometers to determine the attitude and location of the rocket and corrected the rocket’s direction accordingly by ‘gimballing’ or swiveling the exhaust nozzles of the current stage as appropriate. The LVDC was able to ensure that the rocket would remain both stable and on-course, regardless of the size of the payload and the resultant thrust required. The LVDC also managed general navigation, directing the rocket’s various stages from liftoff and into orbit. 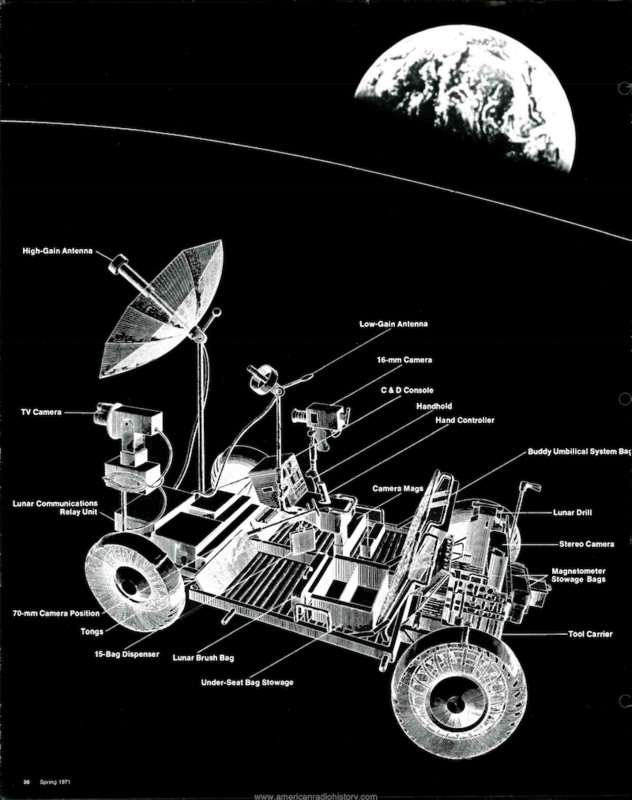 The Instrument Unit also contained environmental systems to ensure proper operating conditions for the LVDC and the analog flight computer were maintained, an emergency detection system that forced an abort if vehicle breakup became imminent, radio communication systems that relayed data to the ground and received commands. The IU was powered by four silver-zinc batteries providing 28 volts DC. 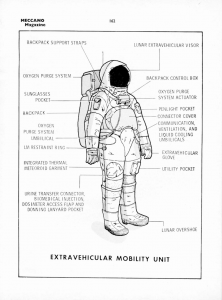 For a human to physically walk on the alien surface of the Moon, they were going to need a serious suit! Once you got the Moon you were going to want to go outside. But with surface temperatures at the equator ranging from -173ºC (-280ºF) to 116ºC (240ºF), the lunar landscape could serve as both a flash-freezer and an oven – not exactly hospitable conditions for soft, pink-skinned vertebrates like ourselves. 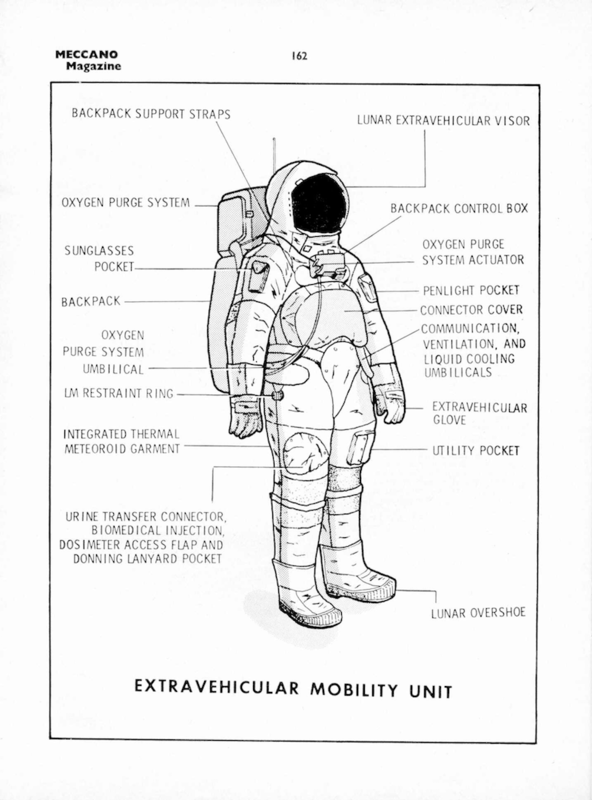 There is also no oxygen, and to make matters more interesting for Apollo engineers, mission planners dictated the suit couldn’t be physically tied to the Lunar Excursion Module – it had to be portable. The solution NASA developed was a backpack-like device known as the Portable Life Support System. It provided two critical functions: first it removed carbon dioxide from the pressurised air inside the suit using lithium hydroxide, which combines with CO2 producing lithium carbonate and water. 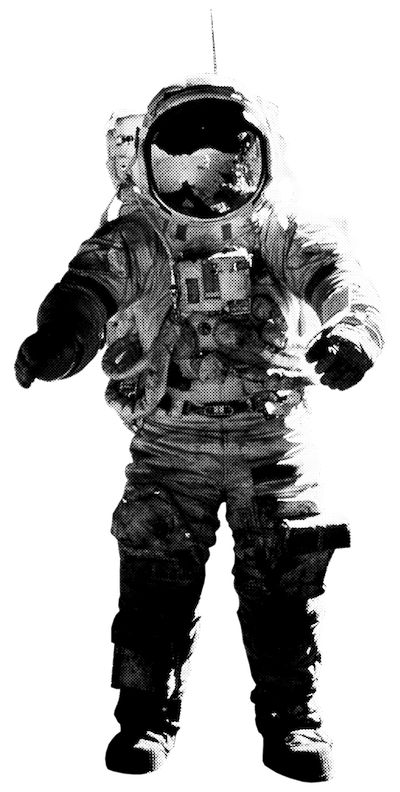 Secondly, the PLSS circulated water through a Liquid Cooling and Ventilation Garment (LCVG) worn by the astronaut under the pressurised exterior suit. This garment contains a network of flexible tubes that make direct contact with the astronaut’s skin. Water is circulated through the tubes, which draw heat away from the body and prevents the astronaut’s core temperature from becoming unmanageably high while exposed to direct sunlight walking on the lunar surface. The water made its way through the LCVG and returned to the PLSS, where it was cooled by passing it through an ‘ice sublimator’ which consists of porous nickel plates. The pores are sized sufficiently to allow water to freeze within them without damaging the plates. 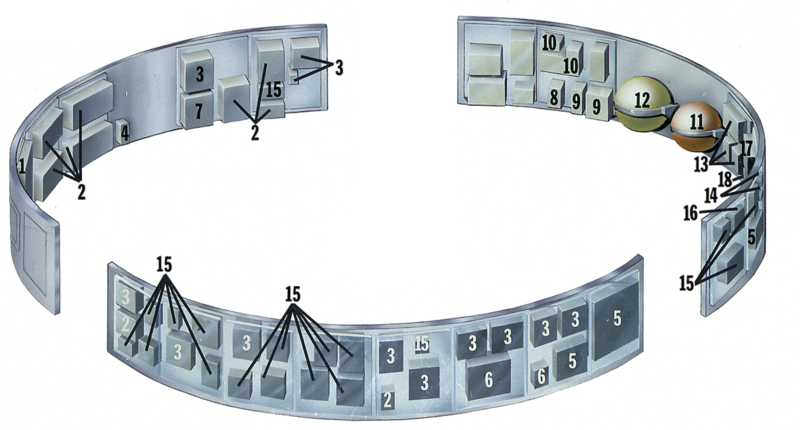 While the documentation available on this process is not completely clear, it appears that while coolant circulation was ‘paused’, water would be applied to the plates which, shielded from sunlight, would quickly freeze. The coolant would then circulate, passing through the sublimator. Due to the lack of atmosphere on the moon, the heated ice then sublimated directly to water vapour, which was then vented away from the suit. The cycle was then repeated. During the Apollo 12 commander’s first moon walk, 2.15kg (4.75lb) of water was sublimated, dissipating 262W of heat. 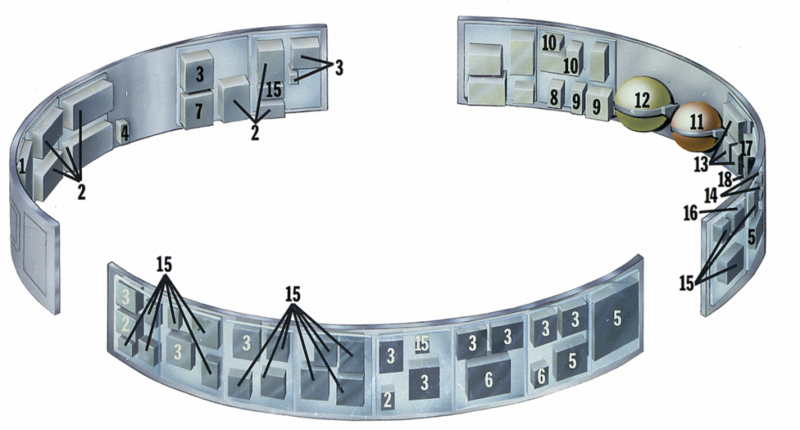 The PLSS used during Apollo 11 contained enough oxygen, lithium hydroxide and water for a four hour lunar excursion. It also had a 279 watt-hour battery. There was also an additional backup in case the PLSS failed known as the Oxygen Purge System (OPS). The OPS was essentially just an oxygen tank that provided a maximum of 30 minutes of emergency oxygen and cooling by venting the suit directly into space. The PLSS weighed 38kg (84lb), which combined with the 19kg (7lb) OPS would’ve been quite a hefty load on Earth, but in the Moon’s one-sixth gravity was only 10kg (22 pounds) – easy to carry! But why walk when you can ride? The Lunar Rover could get you around those Moon craters in style! Even with four hours of excursion time, the lunar astronauts still couldn’t travel that far. Plenty of leeway needed to be given for potential emergencies. And so NASA decided they needed a vehicle for longer-distance travel. 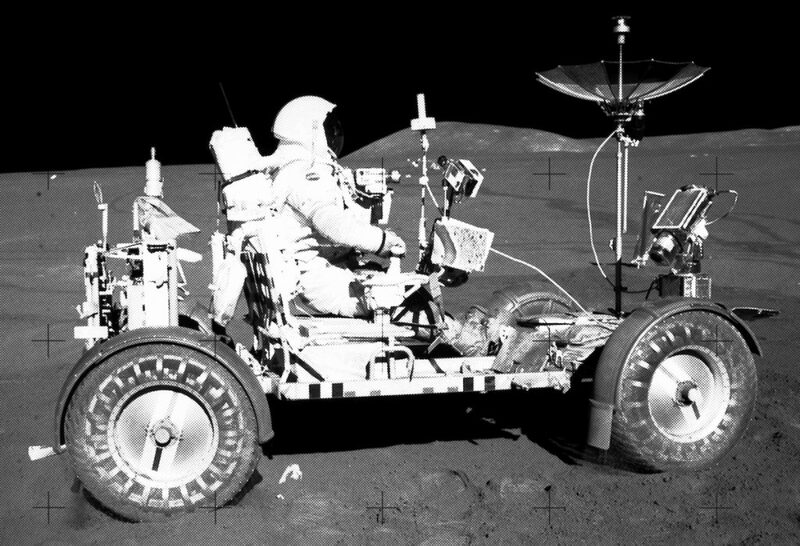 The Lunar Roving Vehicle (LRV), first used during the Apollo 15 mission, was a battery-powered four-wheeled cart carried on the Lunar Excursion Module. Once landed, astronauts would unpack the LRV, use it and leave it behind. 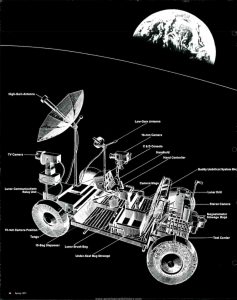 The history of the LRV (or ‘Moon buggy’ as it was popularly referred to by both astronauts and the public) began in the early 1960s, when a series of studies centring on lunar mobility. These earlier studies assumed that a second Saturn V rocket would carry a large roving vehicle and enough supplies for a two-week surface mission to the Moon in advance of the landing party, but the US Congress objected to the cost, insisting on only one Saturn V launch per mission. Consequently a much smaller vehicle would be required. Weighing in at 210kg (460lb), the mostly-aluminium LRV had wheels consisting of a steel mesh overlaid with titanium chevron ‘treads’ used to provide traction. Each wheel was driven by an independent electric motor, and two additional motors steered each axle, allowing for a tight turning radius. These motors were powered by a 36-volt battery that provided a range of 92km (57mi) and a top speed of 13km/h (8mph). 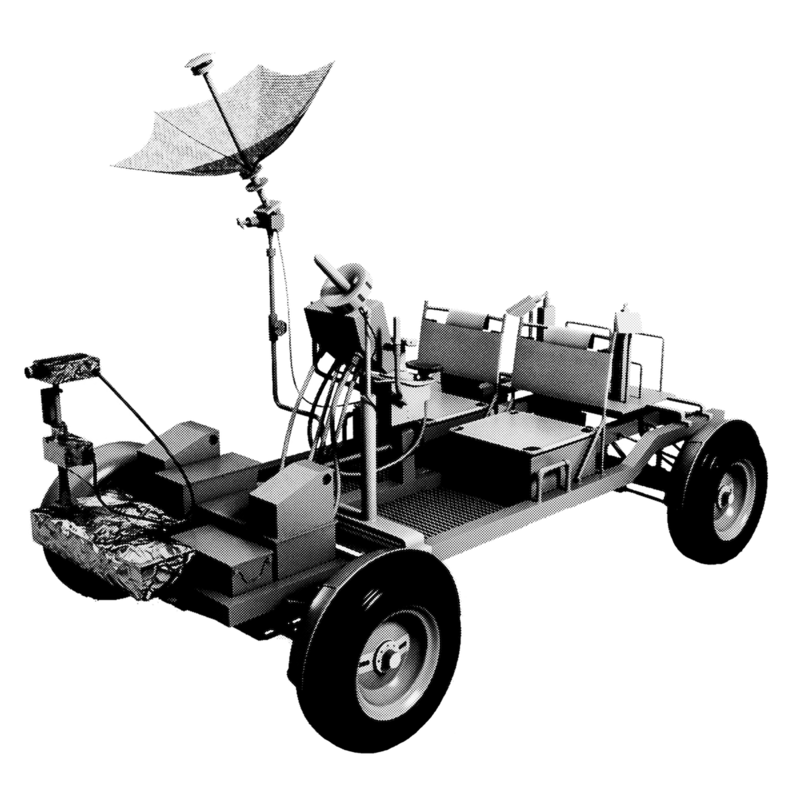 The LRV also contained a navigation computer which constantly kept track of the rover’s location, radios and both film and television cameras.